A new study has found that storks are ditching migration and hanging out at landfills instead. A new study has found a potentially worrying trend: white storks in Europe are foregoing migration and are staying put instead, eating trash at landfills. Normally, the white-and-black birds would be headed to Africa for the winter, but instead they are increasingly choosing instead to stay in Spain and Portugal year-round to eat junk food at landfills, according to a University of East Anglia statement. White storks used to be an entirely migratory bird, with no storks staying in Spain and Portugal, but that started to change in the 1980s with a few individuals, and now those numbers are growing by leaps and bounds. Since 1995, Portugal’s resident stork population has increased from 1,187 birds to about 14,000, with 80 percent of them living around landfills. The landfills are simply too good a source of food for the storks to pass up on, it turns out. To make their findings, researchers attached GPS tracking devices to 48 birds and recorded their data for several years, finding that storks were living permanently in nests at landfills and guarding them. And their lives appear to revolve around the landfills. The researchers were finding that some individuals simply go from the nest to the landfill site and back again. 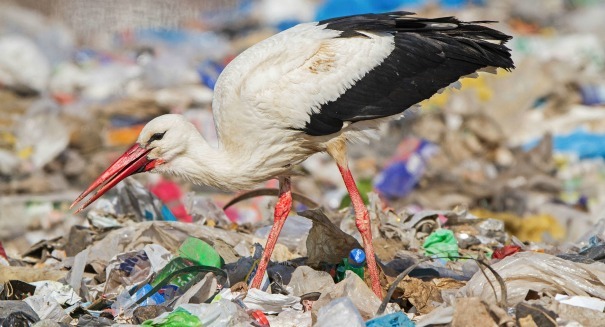 Even storks that lived 30 miles away would make the trip to landfills to eat their fill. Their findings were published in the journal Movement Ecology.